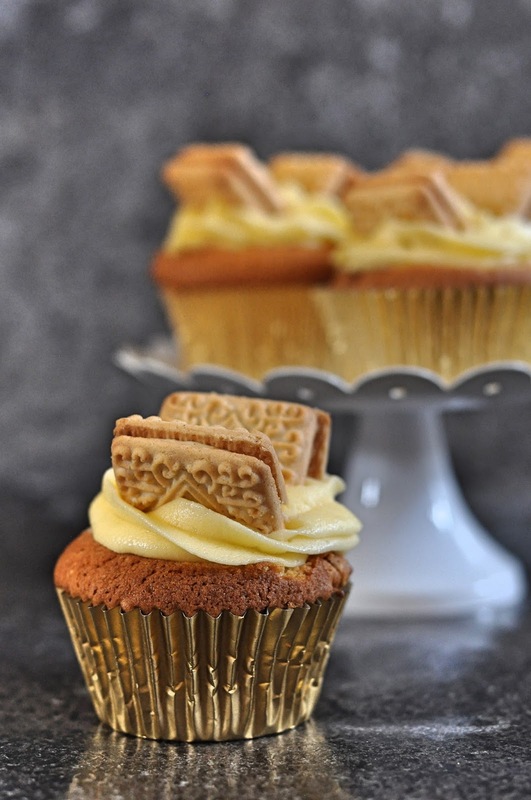 You can't go wrong with custard creams, they really are king of the biscuits in my eyes. Whilst much research has been done on the ultimate dunker, I'll challenge purists and say that these guys are better than a ginger nut. They may not have the sculptural dignity, but they do offer the perfect flavour balance to a brew with the added cream bonus in a bid to hold some shape. Maybe I'm biased, but they truly are my favourite. When hearing all about my friend's new bakery business and all the cupcakes she's making I was inspired to get into the kitchen and make my own...for myself! Cupcakes are the divas of the cake business, only best on the day of baking, but there's something to be said by having your own personal little frosted cake...or three (no one's counting)! 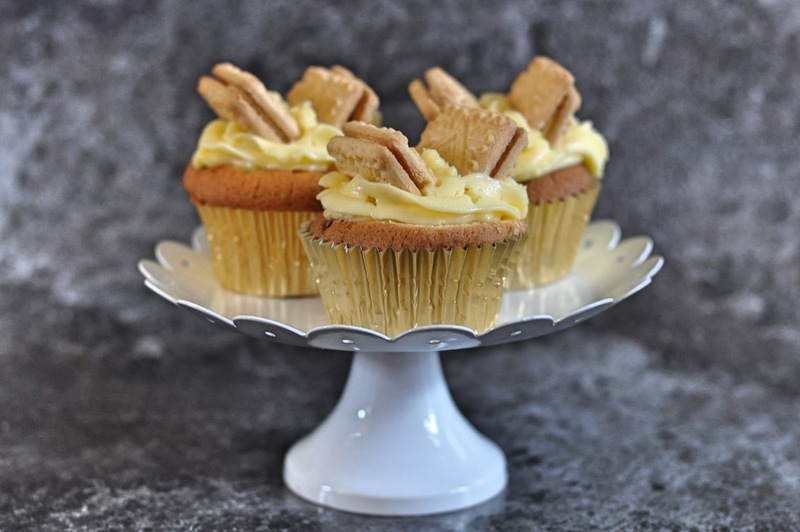 Vanilla sponge packed with crushed custard creams and topped with custard flavour buttercream. In order to have unlocked ultimate cupcake achievement levels, I'd have loved to have made some fresh custard to fill the centres with. But alas, I was hungry and the kitchen is too hot from last week's heat wave (my jar of coconut oil still hasn't set yet). I'm saving my efforts for the Great British Bake Off starting up next month and attempt to bake along again each week. Heat the oven to 180 degrees and line a cupcake tray with cupcake cases. Pour the milk and vanilla extract into a jug and mix together. In a bowl, add the flours and custard powder. Beat together the butter and sugar until light and fluffy. Continue to mix on a slow speed whilst adding each egg, one at a time, beating well after each addition. Whilst continuing to mix, pour in the third of the flour until combined and alternate between the mix and the rest of the flour mix. Add in the crushed custard creams and gently fold together with a spatula. Spoon the batter evenly between each cupcake case, filling up to two thirds full. bake for 15-18 minutes, until a skewer inserted into the middle comes out clean. Leave to fool fully on a wire cooling rack before frosting. To make the frosting, beat the butter on a medium speed to ensure soft before gently and slowly adding in the icing sugar and custard powder. Continue to beat on a low speed at first, then medium until well combined. 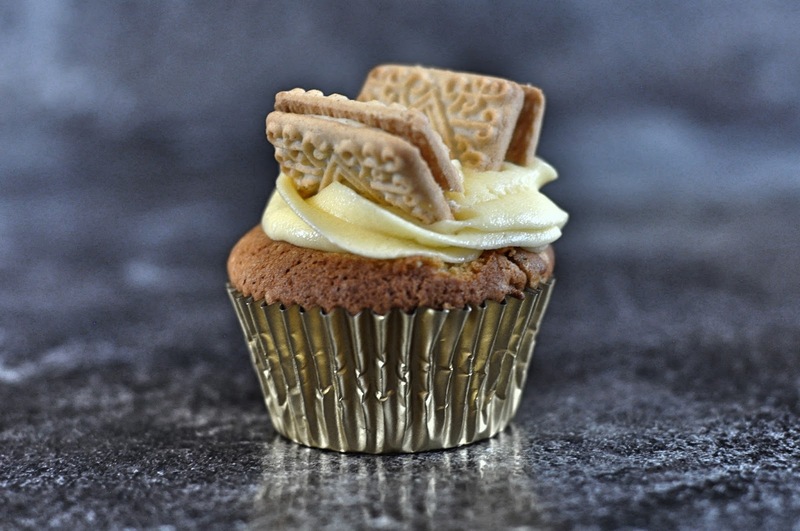 Load the butter cream into a piping bag, pipe a swirl onto the top of each cupcake and top with two halves of custard creams. 2) Where did you find those lovely gold foil cupcake wrappers?? I'm more of a bourbon creme girl, but these look AMAZING!